What a whirlwind of a day this has been so far! Even though that last post (#7) was from the Christmas Bazaar, I need to backtrack and talk about our stop at Original Murdick’s Fudge this morning. We arrived just as Amy Sherman and John “Gonzo” Gonzalez with Behind the Mitten were about to start taping a segment celebrating Original Murdick’s Fudge and their Christmas fudge making on the island. Behind the Mitten is a radio show and podcast about food, festivals, beer and more! Gonzo and Amy interviewed several familiar faces this morning: Susan Wilcox-Olsen (Media and Marketing Manager for the Traverse City Cherry Festival – and summer resident on Mackinac Island), Bob Benser (whose family owns Original Murdick’s Fudge), and Andrew Doud (owner of Doud’s Market and year-round island resident). Everyone talked about fudge, but there were also some great stories told by these three about the experiences they’ve had on the island – both during the summer season and during the winter months! You can check all that out at BehindtheMitten.com. 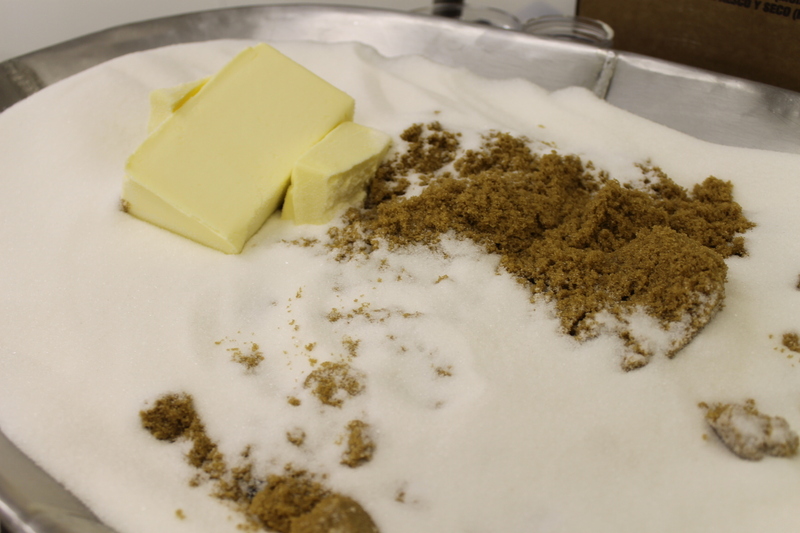 And for a great behind-the-scenes video about the whole fudge-making experience – from kettle to packaging – check out their Facebook page “Behind the Mitten with Amy Sherman and John Gonzalez”, which is open to the public. 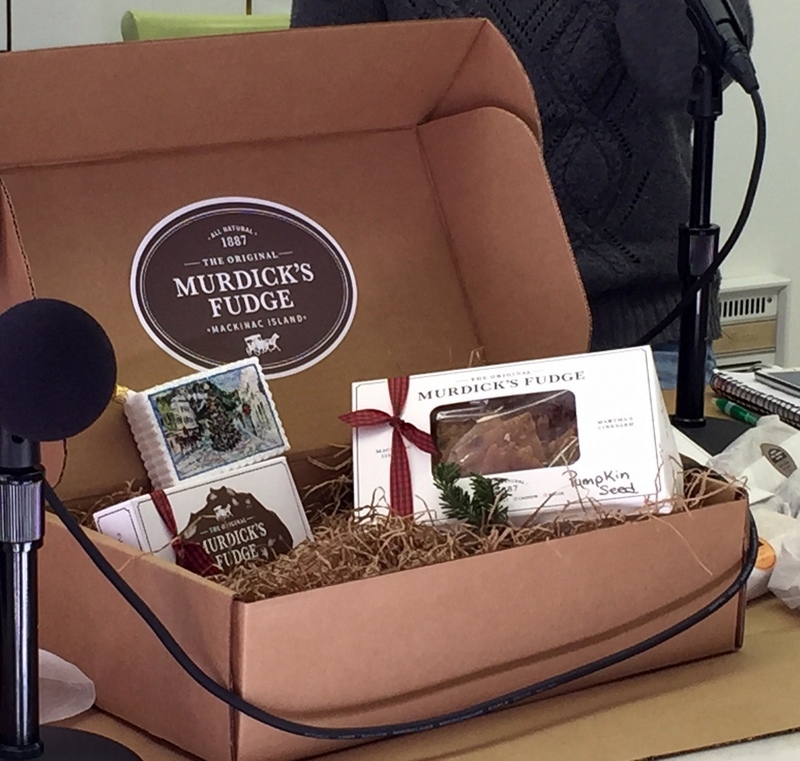 During one of the taped segments the duo talked about the 12 fudge flavors (one for each of the 12 Days of Christmas) being offered for shipment this season. You can choose from Butter Pecan, Chocolate Mint, Cranberry (a new Christmas flavor), Double Chocolate, Maple Walnut, Peanut Butter, Chocolate, Chocolate Peanut Better, Chocolate Walnut, Double Chocolate Caramel Sea Salt, Pumpkin Spice, and Turtle. 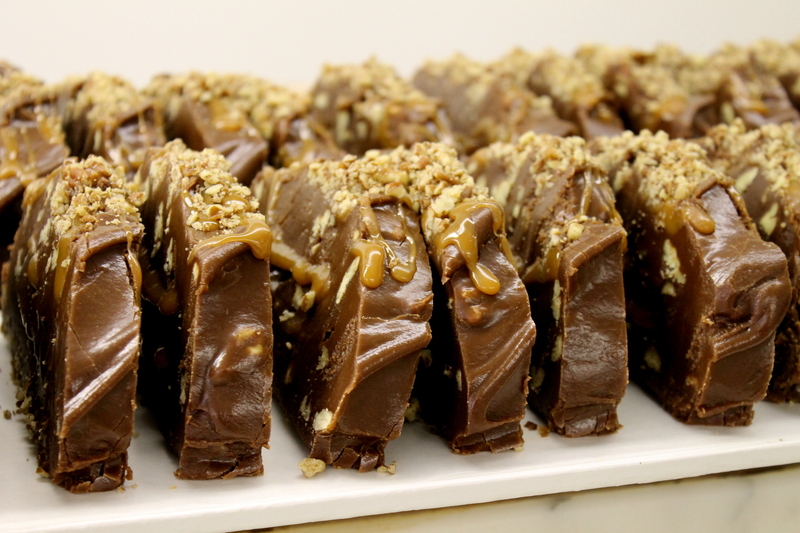 Original Murdick’s Fudge is also offering three different flavors of Brittle – Peanut, Pecan, Cashew, and Pumpkin Seed. In between taping segments I walked around and watched a batch of fudge being made from scratch. Lots of sugar and chocolate (the ingredients change depending on the flavor of fudge) . . .
. . . butter – the real stuff. . .
. . . all mixed in a cooper kettle with milk and a few other ingredients and cooked with constant stirring. 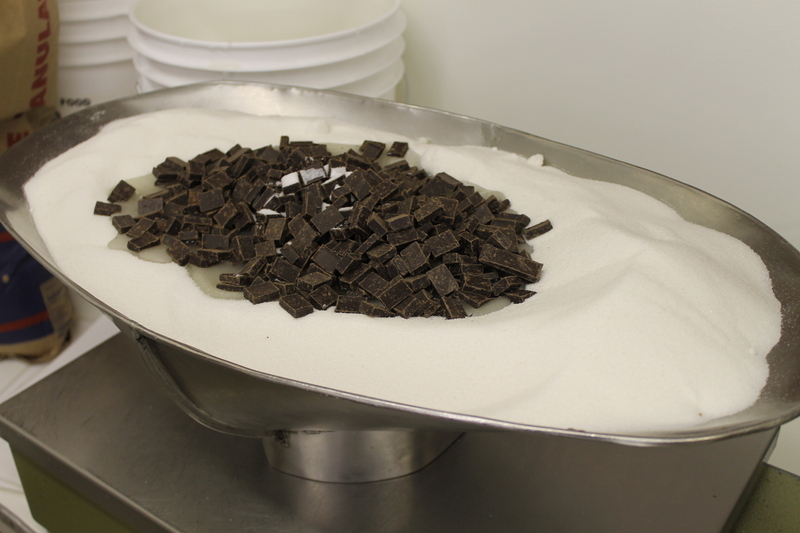 When the fudge gets to exactly the right temperature, it is poured out onto marble-top tables (also kept at just the right temperature by placing electric blankets over them at night when it’s cold). 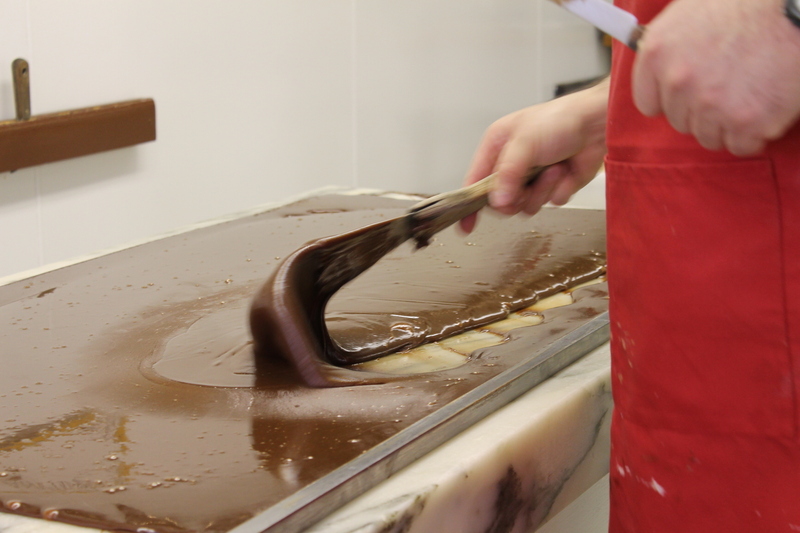 That’s when a master fudgemaker takes over – stirring and shaping, stirring and shaping as the fudge cools. This process is so precise I couldn’t lure this fudgemaker (Ricardo) away for even a minute to take a group photograph. When everything is done perfectly, the finished product . . .
. . . is perfectly delicious! 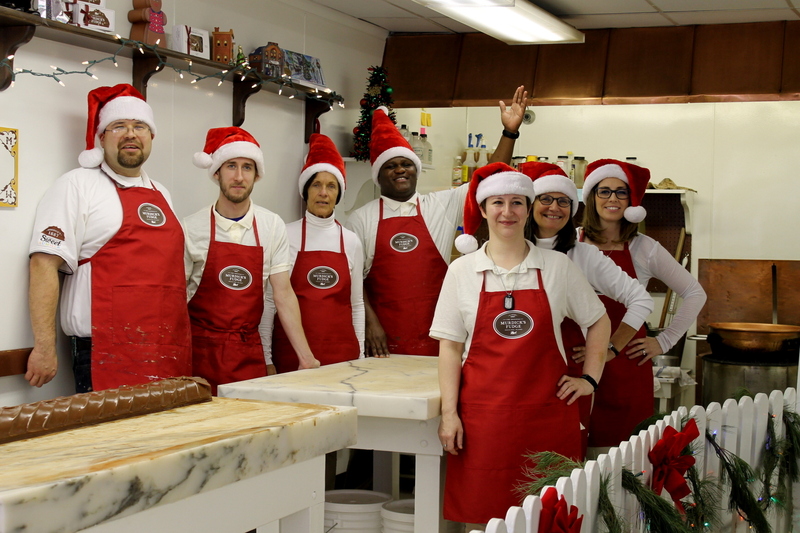 This talented group of fudge-makers will be cooking and shipping fudge through December 17 for your Christmas orders! And don’t forget – your fudge or brittle orders will come beautifully packaged in one of several holiday boxes. To order, simply click on originalmurdicksfudge.com and start making your selections! And . . . through December 17, Bree’s Mackinac Island Blog readers will receive a 15% discount by entering “Breesblog” in the discount coupon box at the end of the order process. And yes, I sampled . . . let’s just say “quite a few” of those 12 flavors! Yummy, Yummy, Yummy! Back soon with more news! This entry was posted in Mackinac Island, Mackinac Island Blogs, Mackinac Island living, winter on Mackinac Island and tagged Behind the Mitten, Behind the Mitten with Amy Sherman and John Gonzalez, Original Murdick's Fudge by bree1972. Bookmark the permalink. Ok……now I REALLY want fudge! Loved the photos. Looks like you are having a great time! Betty, all the 12 flavors are available. Why don’t you do this – call Lori at 989-390-1045 and she will personally take your order. You can call before 5:30 today and anytime after 9:00 a.m. in the morning. Hope that helps. Thank you Brenda. I’ll call tomorrow. So enjoy reading all about Murdicks. We were very lucky this year. 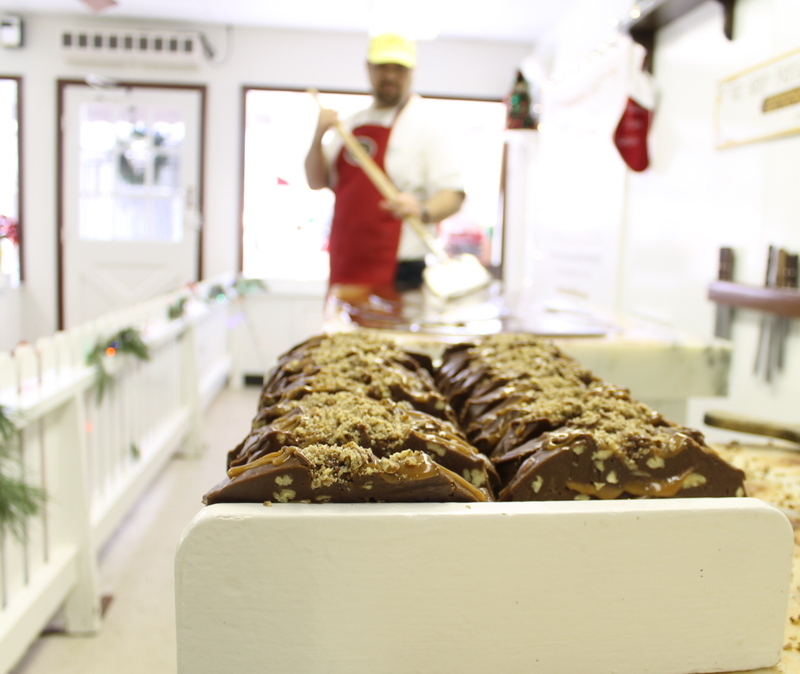 John had business near Frankenmuth, so he got plenty of fudge. Some for gifts, and some for us. An ad came up on my Facebook newsfeed. Now how did they know? Funny. Enjoy your family and fudge for Christmas.